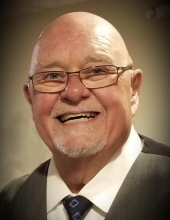 Donald “Don” “Donny” Maurice Vanderwyst, 68, of Marshfield, passed away with grace, peacefully in the arms of his wife Deb, surrounded by his children and siblings at his home on Sunday, February 3rd, 2019. Don was born to Maurice and Rita (Zeidler) Vanderwyst on March 9th, 1950 and graduated from Marshfield High School in 1968. On March 9th, 2009, Don married Debra Ackman. Don’s previous marriage was to Beverly Tews who currently resides in Marshfield. Donny and Deb had a unique and genuine love for one another; their marriage was lighthearted and filled with spontaneity, adventures and joy. Donny was a dedicated, loving father who enjoyed spending quality time with his children, grandchildren and family. He valued family and was held in the highest regard by all. Donny was a respected man who was often looked to for strength and wisdom. Don was a life-long resident of Marshfield, an avid member of the USW Steel Workers Union, a talented athlete who played softball and later golf with enthusiasm, enjoying these moments with friends. Don served in the Army Reserves from July of 1969 until January of 1975. He worked for Marshfield Doors, retiring on March 9th, 2013 after 45 years of service. Don is survived by his wife Debra Ackman-Vanderwyst, children, Mike (Jodi) Vanderwyst, Kristine (Randy) Luepke of Marshfield and Jessie (Jazmin) LaPlante-Ackman of Madison, grandchildren, Will and Haley Vanderwyst and Natalie Luepke, and siblings of Marshfield: Kathy Shupe (Ron Appleman), Steve (Marilyn) Vanderwyst, Mark (Christine) Vanderwyst; Jack (Cheryl) Vanderwyst of Hewitt and Tom Vanderwyst of Eau Claire; sister-in-law Sandra Vanderwyst of Holman, in addition to a number of nieces and nephews. Donny is further survived by in-laws, Herman (Rose) Ackman of Milladore, Theresa Seehafer of Spencer, Mary (Robert) Zygowicz of Colby, Doug (Tracey) Ackman, Mike (Kristy) Ackman of Spencer, Dawn Ackman of Indianapolis, September (John) Kozicki of Rudolph. Stephan (Tracy) Dawson of Marshfield and Shawn (Lynda) Dawson of Energy, IL.,in addition to a number of nieces and nephews. Don is preceded in death by his parents, granddaughter, Kayla Vanderwyst, brother, Jim Vanderwyst, brother-in-law, Ron Shupe and niece, Kim Shupe. Donny was loved by many and we know that, that special love lives on. He will be deeply missed. A celebration of life will be held at 11:00 am on Saturday, February 9, 2019 at Rembs Funeral Home. Visitations will be held on Friday from 4 to 7pm at Rembs Funeral Home and again on Saturday from 10:00 am until time of service. "Email Address" would like to share the life celebration of Donald M. Vanderwyst. Click on the "link" to go to share a favorite memory or leave a condolence message for the family.